The market in flowers with genetically engineered colors is (to my knowledge) occupied by a single Australian company called Florigene. 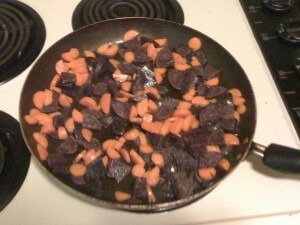 They study anthocyanins, the class of plant pigments responsible for, among other things, the coloration of purple potatoes, purple carrots, black rice, purple corn, and many blue and purple berries. Anthocyanins are one of the key classes of plant pigments, found to greater or lesser extent in most flowering plants. 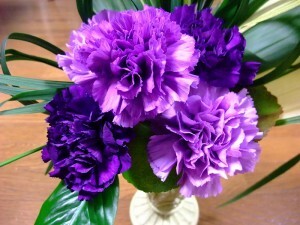 * Florigene has been producing purple and sometimes blue carnations since the 1990s by adding key enzymes in the anthocyanin pathway from other plant species. While purple carnations are cool, the real goal of Florigene’s work has been blue (and purple, and violet) roses, something rose breeders have been trying and failing to create for centuries. Florigene was granted a license to grow their first breed of genetically engineered blue rose this summer, (although as far as I can tell the roses aren’t yet for sale, so they don’t get their own post). For more on plant pigments, Florigene, and why the development of blue roses as foiled breeders for so long, check out this fascinating post by MAT Kinase. Carnations belong to the caryophyllales, an extended family of plants that include cacti (cool), rhubarb (tasty), and carnivorous plants like sundews and venus fly traps(awesome!). Beyond that, I’ll admit I don’t know much about their biology. *The extent of anthocyanin biosynthesis in flowering plants is a good indicator that the ancestor of all the flowering plants alive today (which lived sometime between 250 and 100 million years ago) already contained the genes needed to produce anthocyanins, and flowering plants which are unable to produce them today, like roses, cannot because their ancestors lost the ability. Posted in: Crop Profiles, Genetics, Plants. Well, I like them–and I’ve always been surprised that they got approval in Europe in what seemed a less, ah, contentious process than other modifications. I suppose that’s because it’s not food. Some people separate out their arguments as food/not food, but if you have a beef with GMOs in theory I don’t see how it’s different. But one time I did a blog post on a drug produced in carrot cells (by a company called Protalix) and I got hate mail. Despite the fact that it was produced in the lab, not in field carrots. The very outspoken anti-GMO people definitely don’t care about the difference between food and not food, but I think it must be much harder for them to whip up public opposition in the case of non-food crops. For years, bt cotton was the only genetically engineered crop approved for india (although seed containing the trait was smuggled into the country prior to approval), and one of two crops, along with the carnations, being grown in Australia. Australia has since approved genetically engineered canola, and india is evaluating bt brinjal (eggplant), which makes me think non-food crops serve an important role is getting the public more comfortable with genetic engineering (which gives anti-GMO activists all the more reason to fight them tooth and nail). I’ve yet to get any real hatemail. Something to look forward to in the future I guess. Blue roses, I’ll be damned. I can’t imagine getting hate mail over blue roses or carrots.